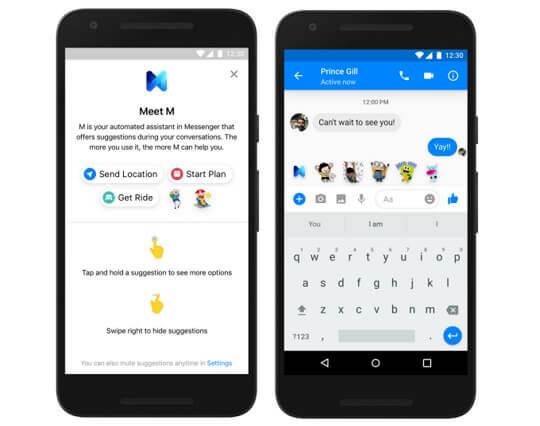 Facebook Messenger is now embracing artificial intelligence with the introduction of its new helpful assistant named M.
M is not a full-blown smartphone assistant, but it does a lot of things. Currently, its job description includes offering suggestions. It works by "popping into an open conversation to suggest relevant content and capabilities," hoping to upgrade the way people converse and do things. Meet M. Helpful M was born from an AI experiment and raised to have the ability to fulfill people's requests. With that serving as its background, M is able to work efficiently. M's special ability is to recognize intent in a conversation and basically suggests actions that people might take. Relying solely on AI machine learning techniques, it sends fun stickers, options for paying or requesting money, ability to share your location, help to coordinate a plan, and even starts a poll when your group needs one. It will even give suggestions when you need a ride to go somewhere. Facebook Messenger's M is available for all iOS and Android users. It is only available in the US as of the moment, though, but there are plans of eventually rolling it out to other countries.